An announcement voiced by the #Ukrainian #President Petro #Poroshenko last week made headlines in the country’s media. In his address to the #Ministry of Foreign Affairs of Ukraine, he assigned them with a task of #filing a #lawsuit #against Russia to the #International Court of Justice in the Hague. The lawsuit is a response to the alleged violations of the International Convention for the Suppression of the Financing of Terrorism and the International Convention on the Elimination of All Forms of Racial Discrimination (ICERD) by the Russian Federation. The spokesman at the Ministry of the Foreign Affairs of Ukraine later specified that the lawsuit was to be delivered to the court personally by the Ukrainian Ambassador to the Netherlands on Jan 16, 2017. “The Russian Federation has been brutally violating international law for three years. For three years, Russia has been committing the illegal annexation of Crimea, illegal occupation of the east of our country in the territory of Donetsk and Luhansk regions, implementing the policy of elimination and discrimination in Crimea,”, said the Ukrainian President in his speech. He also reminded of the many crimes committed by the terrorists against civilians in Mariupol, Volnovakha, Kramatorsk as well as the MH-17 tragedy. The President expressed his confidence in the fact that since the beginning of the military conflict Ukraine strictly followed the international law. He noted that the lawsuit is a result of a continuous pre-trial work to gather conclusive evidence and hold a large number of meetings and working sessions. Now, the first part of the lawsuit is classified under the International Convention for the Suppression of the Financing of Terrorism. The other part of the lawsuit appeals to the International Convention on the Elimination of All Forms of Racial Discrimination. The President concluded that Ukraine is now ready to submit the necessary documents to the International Court of Justice. Ukraine wants to prosecute Russia for illegal confiscation of the Ukrainian assets and deposits, capture of the Ukrainian mines and fisheries, environmental damage and a number of other crimes which caused Ukraine to bear significant losses since the annexation of the Crimea and Donbas occupation. 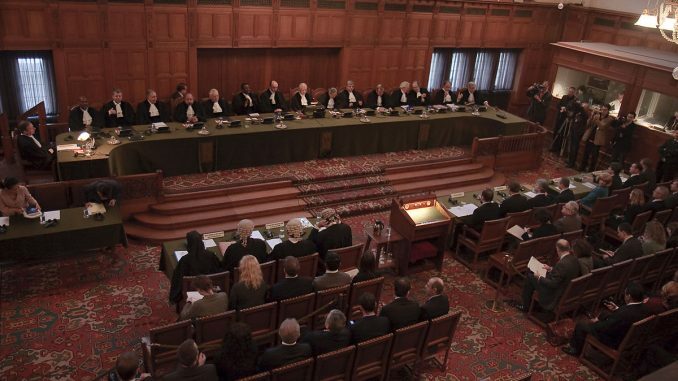 As was reported earlier, Ukraine has also filed lawsuits against Russia to the International Court of Justice in the Hague in response to the Russian occupation of the Crimean peninsula and crimes committed by the occupying force on the territory of the Donbas region.